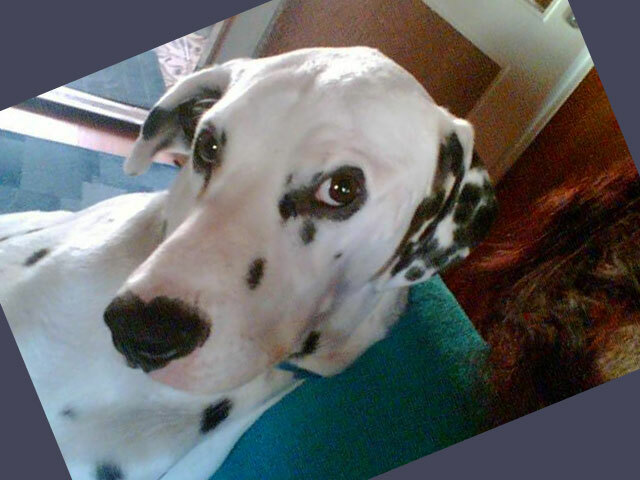 We advertised Dodi as a mediated Dalmatian for adoption since October 2012. 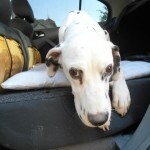 The shy but lovely, skinny boy was looking for a sweet home through the Tetovált Állatmentők (Tattoed Animal Rescuers). His relationship with his foster family got stronger every day and they decided to adopt him as the result of the two-sided love. 29.11.2012. – Thank you for your support! Until now, a donation of 29.500 Ft arrived to our association’s bank account for Dodi. 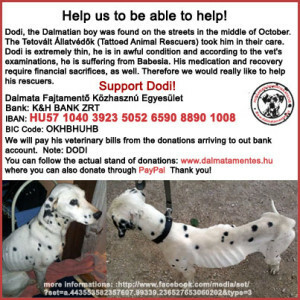 We forward the whole amount to the Tetovált Állatmentők (Tattoed Animal Rescuers) in order to cover Dodi’s veterinary costs. Thank you for your support! 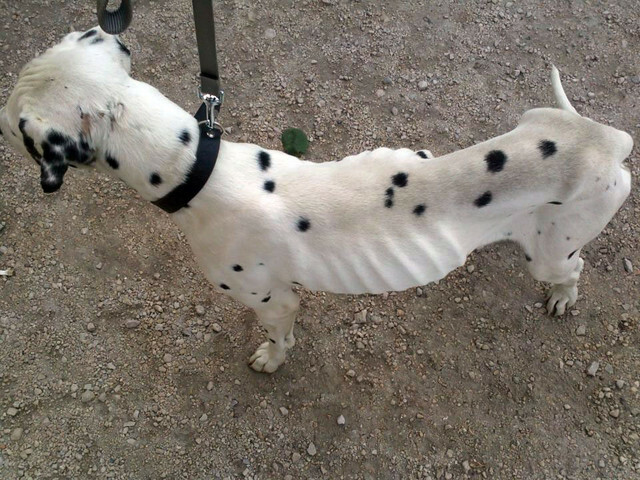 Dodi, the Dalmatian male found in Pápa has regained his strength and pretty shape. In the meantime a family applied for him. They proved to be promising candidates so if everything goes well, Dodi can move to his new home next week after neutering. He will live the happy life of single dogs in a nice flat. Dodi truly deserves all the love and care a dog could ever dream of. Keep your fingers crossed with us for Dodi! 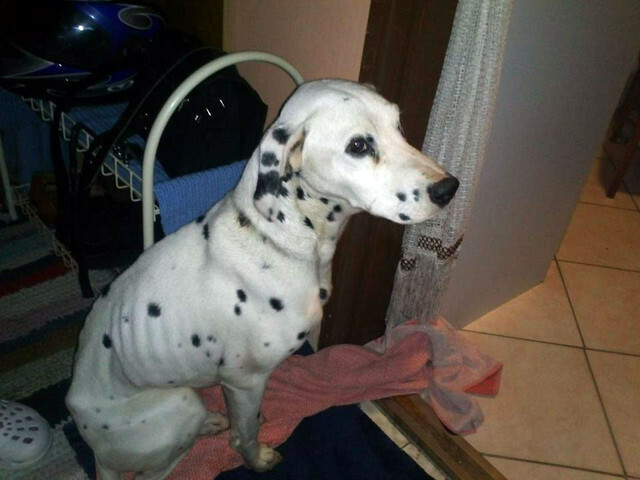 Dodi, the Dalmatian boy was found on the streets in the middle of October. The Tetovált Állatvédők (Tattoed Animal Rescuers) took him in their care. 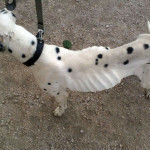 Dodi is extremely thin, he is in awful condition and according to the vet’s examinations, he is suffering from Babesia. His medication and recovery require financial sacrifices, as well. 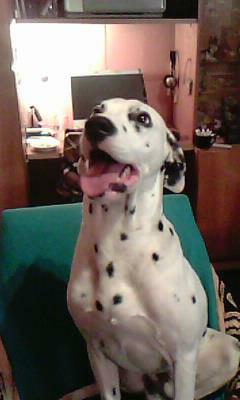 Therefore we would really like to help his rescuers. 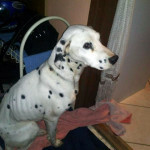 We will pay his veterinary bills from the donations arriving to the HDR’s bank account. 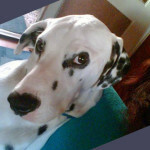 You can see the actual stand of donations on our homepage (www.dalmatamentes.hu), where you can also donate through Paypal. 20.10.2012. – Dodi needs a home! 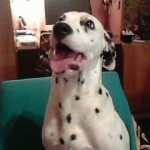 Dodi, our little cartoon figure is a 1-4 year-old Dalmatian male. We found him in awful circumstances. He is antisocial with other dogs, therefore recommended as a single dog. Adores people, longs for love more than anything. Hasn’t met cats so far. Housebroken, loves sleeping on the couch and in bed. 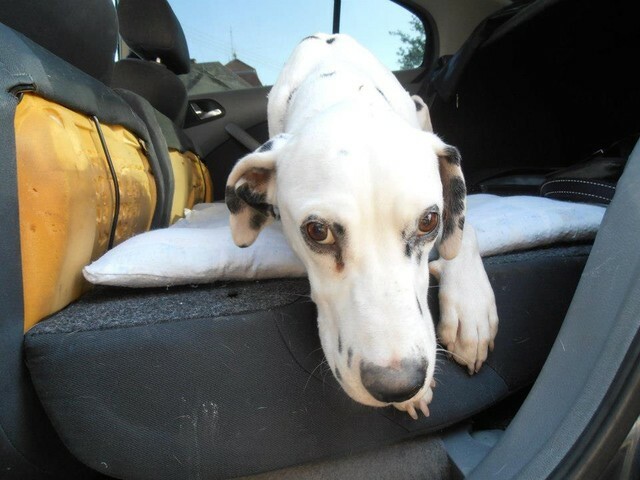 Dodi is waiting for a loving and patient owner.